Latest version of the SurvitecZodiac MIS MES escape slide & liferaft system is fitted to the new ferry 'Uraniborg'. The Uraniborg, owned by Ventrafiken, was recently completed at the Hvide Sande shipyard in Denmark and has just entered service between Landskrona and the island of Ven located in the Oresund between Sweden and Denmark. 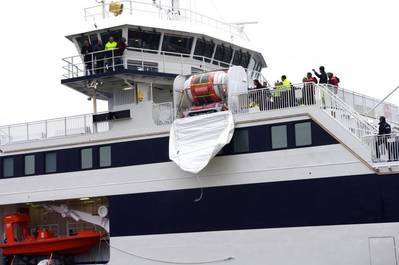 The new ferry is fitted with two SurvitecZodiac escape slide systems that each contain two 151-person open reversible liferafts. The deck installations are the first to feature a soft fabric cover that protects against the weather and ultra-violet light, while also offering valuable cost savings to the customer. Besides being substantially lighter than a traditional GRP casing, the cover can be quickly replaced at a much lower cost if it is damaged. Before the Uraniborg entered service, the escape slide system was subjected to a full scale trial in the harbour at Hvide Sande. The 14.5-metre double slide was launched from a height of 9.3-metres and the first raft was automatically deployed. The pre-connected second raft was then launched from the first to create capacity for over 300 passengers and crew. When used in a genuine emergency and the ship evacuation is complete, the last crew member to disembark can activate a pyrotechnic knife patented by SurvitecZodiac. This device allows 30 seconds of escape time before it separates the slide from the ship. The slide design is known to provide the fastest evacuation speed for small to medium-sized ships and high speed craft as it can enable the escape of 731 passengers in 30 minutes when used with SurvitecZodiac’s Throw-Over 150 person canopy liferafts. Manufactured in France, at the modern Survitec Group factory at Chevanceaux near Bordeaux, the escape systems fitted to the Uraniborg are EC(MED) approved by Bureau Veritas.